Poplar grows in Europe and North America. The colors range from creamy white to gray; sometimes with a greenish tint. Poplar is used for moulding, kitchen utensils, food containers, boxes, crates and baskets. 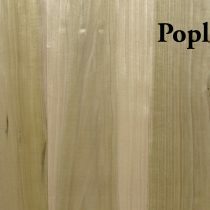 Poplar is one of the more common hardwoods used due to it being economical and readily available. S4S: This item is in stock already surfaced on all four sides. It is readily available at store.